Whether you’re a freelancer, startup or a growing small business, the Ingenico iCMP Mobile POS Solution can help you increase sales, improve cash flow and enhance customer satisfaction by accepting mobile payments. The iCMP is a convenient and secure payment solution that transforms any iOS (iPhone, iPad) or Android device into a powerful payment platform, offering full EMV and contactless credit and debit card acceptance. The iCMP is small in size, but big on features. Process transactions, manage customers, load inventory and get valuable, real-time insights into your operations with real-time transaction detail reporting available through our online merchant portal. With its state-of-the-art security standards such as EMV Level 1 and 2 and PCI PTS 3.1, the iCMP solution securely processes transactions, ensuring that sensitive data is never present on your mobile device. You can accept payments wherever you have wireless coverage, with either your current cellular data plan or via Wi-Fi. Payments are processed in real time, with an e-receipt generated and sent to the customer via e-mail as soon as the transaction takes place. Turn your smartphone or iPad into a fast, safe, flexible, debit and credit terminal. 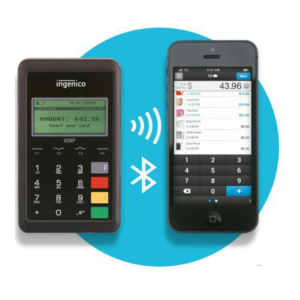 Bluetooth® connectivity for easy pairing with your iOS® or Android™ device with Mobile POS app. Mobile POS app available in the App Store. Interested in learning more about Mobile Payments?